IN THE CITY IS THE UK'S ANNUAL MUSIC INDUSTRY CONVENTION. It was founded by Tony Wilson and Yvette Livesey in 1991 to provide a place where music industry people can come together and talk, discuss issues, make deals and most importantly, see a selection of unsigned artists, some of whom will go on to be the mega-stars of tomorrow. I was privileged to attend In The City as a full delegate, covering the event for KPMG, one of the main sponsors. RUSSELL WATSON made a guest appearance at the In The City music convention - introducing, and then concluding, a talk by one of the most influential bosses in the music business, John Kennedy, CEO of Universal. Russell walked on stage and to a backing track gave an astounding and impeccable performance of "Nessun Dorma", made famous by Pavarotti. 'The Voice', as his first album is called, was all-encompassing, and even after Russell had left the stage, it continued to ring in our ears. Russell Watson's career was launched in mid-2000. The lad from Salford has already performed in front of thousands, including many football matches. 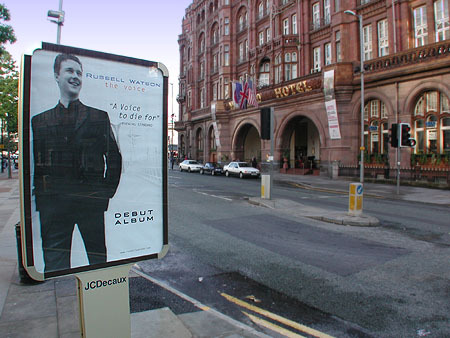 POSTERS OF RUSSELL WATSON promoting his first album, entitled 'The Voice. appeared, co-incidentally, around the time of the In The City music industry convention, which took place at the Midland Hotel Manchester in September 2000. 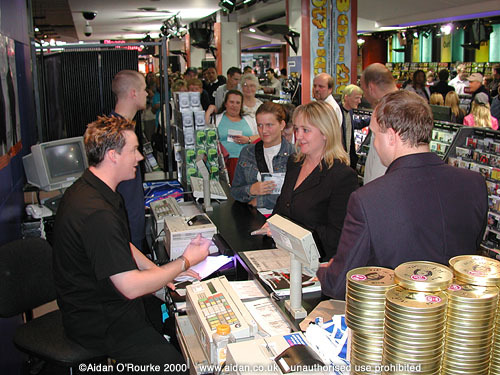 I was invited to witness a performance and CD signing at the HMV music store, at the top of Market Street on Monday 25 September 2000. Just a few feet away from me, I saw the maestro perform, once again, "Nessun Dorma'. As ever, it was faultless, but the transition from giant of opera to local lad was just as noteworthy. "Alright then, I'll sign yer CD's now," he said modestly. Russell looks like he could be a member of well-groomed vocal group 'Steps' - an essential asset these days, whether in the classical or pop world. Let's hope people appreciate him for his monumental talent, and not as a creation of a PR campaign. RUSSELL WATSON signs copies of his debut CD 'The Voice' at the HMV music store on Market Street. It's about 5.15 pm on Monday 25 September 2000. Russell is one of the most talented new acts to emerge from Manchester in many years. In 2000, he shot to stardom singing a style of music which used to be the preserve of the classical music buff - Opera. Now, Russell is determined to bring this style to a mass audience. The campaign appears to be successful - six days after I took this photo, the album went into the pop charts at number 13 and to number one in the classical charts. Russell is at his best, in my opinion, when singing classic Italian Opera. On the album, the first track is my favourite. I'm less keen on cover versions of pop songs as 'Vienna', by Ultravox. But they've been included for a purpose - to gain a wide appeal. It's great to witness real talent and professionalism and to see it rewarded by massive popular success. 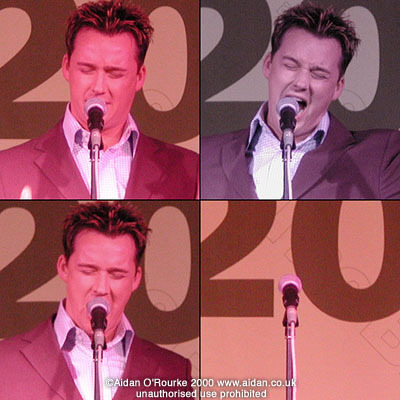 I'm sure Russell Watson will have a long and successful career and I hope to feature him again on these pages soon. 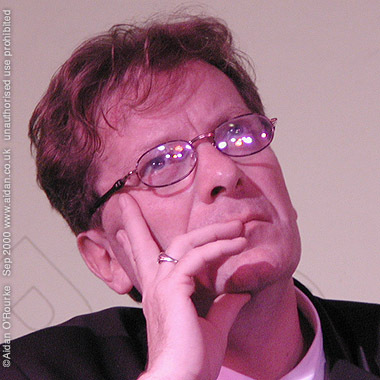 WHAT IS TONY WILSON THINKING ABOUT? 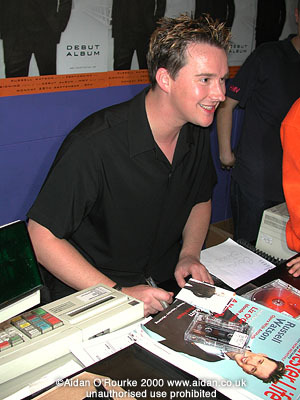 He is pausing during an interview at his In The City music industry convention, held in September 2000 at the Crowne Plaza Midland Hotel. Tony Wilson started broadcasting in the mid-seventies - his TV show 'So It Goes' documented the early explosion of punk. In the eighties he co-founded Factory Records and was the impresario behind New Order and other Manchester bands. He founded the Hacienda, still Manchester's most famous night club, and after it closed in 1997 he argued it should be knocked down, rather than kept as a museum. (It is being converted into apartments). He is often contrary, sometimes rather abrasive, fashionably peppering his speech with swear words. In interviews, he talks 19 to the dozen, fascinating, but very difficult to transcribe and organise. He has presented many TV shows, including brash Granada local talk show 'Up Front' and an off-beat late night arts programme. In 1991 he co-founded In The City, the UK's music convention, and has seen it go from strength to strength. He's still passionate about music and, according to his 13 year cycle theory, reckons that 2002 will see the next tital wave of music. Maybe that's what he's thinking about now - or maybe 'I wonder what we're having for tea tonight.' Who knows? MARK OWEN appeared at In The City 2000 as a panelist on the panel amusingly titled: 'Not F... Me, F... You - the Vulnerability of the Manager' (I think I know which co-founder of In The City thought up the name). Mark Owen was a member of one of the most successful and talented boy bands of the first half of the nineties, Take That, founded by Gary Barlow. Robbie Williams left Take That suddenly in 1995, and went on to be the UK's most successful solo male vocalist in recent years (and in Eyewitness' opinion the most over-rated and over-hyped). Take That split up in 1996, and Mark launched his solo career in November of that year. He had a hit with 'Child' and released the album 'Green Man'. Take That was managed by Manchester-based impresario Nigel Martin-Smith, who had a protracted legal dispute with Williams, who eventually lost. 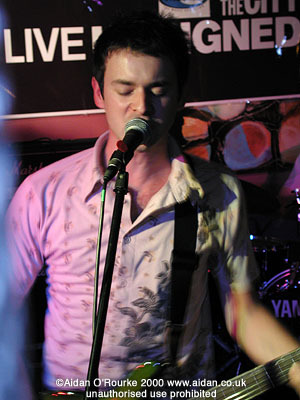 BABELTREE appeared at In The City Unsigned 2000, playing at Barça bar, in Castlefield. The unsigned bands are selected by In The City A&R man Phil Saxe from thousands of hopefuls who send in their recordings. 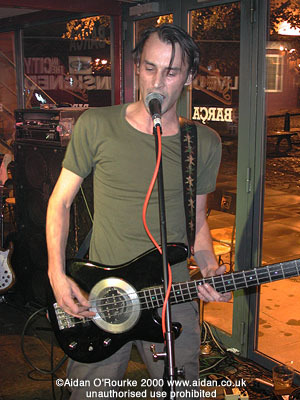 In the era of computer-driven musical instruments, effects and recording studios, Babeltree demonstrate what's possible with nothing more than a drum kit, electric guitars and good sound system. Their Barça appearance was loud, powerful and passionate, with all the raw energy that a three piece can deliver. The question is: Can a three piece drum and guitar band succeed in today's music industry? I hope so! In The City was a fantastic but all too short four day period, in which I saw famous figures of music, new media and art, and witnessed some exciting new talent in the nighttime Unsigned showcase. The official In The City website is at www.inthecity.co.uk. More bands, and some Manchester music reminiscences on the NEXT PAGE.